Australia’s ANZ-Roy Morgan consumer confidence lifted by 2.2 percent after a fall of 4.6 percent last week. The index is still below the long term average of 113.1. Current financial condition jumped by 6 percent; the increase comes after the falls in the previous three readings. Future financial conditions were also up by 1.7 percent. Current economic conditions were up 4.8 percent after the sharp fall of 7.9 percent last week. Future financial conditions were up marginally by 0.1 percent. The ‘time to buy a household item’ fell by 0.5 percent, its third consecutive fall. Four-week moving average inflation expectations were stable at 4 percent. "The weekend just past was overshadowed by the tragic events in Christchurch on Friday. 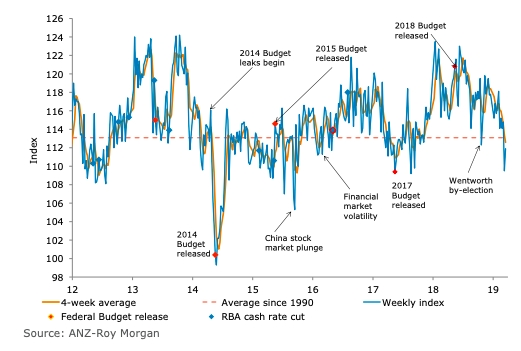 This makes it very difficult to offer any firm conclusions about the partial recovery in confidence after the prior weekend’s sharp decline," said David Plank, ANZ’s Head of Australian Economics.